The most recent friend that I have acquired, is a very well-spoken young lady. She has definitely made an impression on me with her unique sense of self, that I think is rare amongst people in their twenties, these days. She expresses herself globally, with her choices of verbage such as pretentious and guilty pleasure. 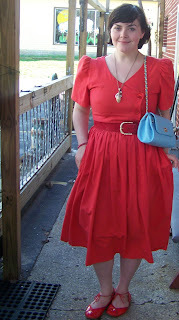 Fashionably wearing vintage pieces and handbags. And intelligently by having an educational background from the University of London. Annie Stultz is my new best friend and if you follow this link, Annie's link you can find out more about her. But, I would like to highlight the fashionable side of her, because in my opinion, she has a point of view worth listening to. Smooches. Vintage dress and a vintage Chanel handbag, vintage belt and a gold mickey mouse grenade necklace. I apologize for having on the time stamp, I spaced it!